Subtle, glowing skin was all the rage at the White House Correspondents’ Dinner this weekend. Stars like Claire Danes and Olivia Munn let their couture and their flawless features do the talking with glowy cheeks and understated eyes and lips. This 9-in-1 makeup bag must-have primes, moisturizes, minimizes pores, conceals, covers, smoothes, mattifies, brightens and protects with SPF 25 for a flawless, 100% natural look. Give your face a sunkissed glow with Rimmel’s Natural Bronzer. 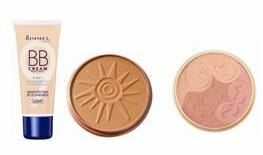 Available in four flattering shades, this bronzer is infused with minerals for a stunningly natural bronze. A trio of perfectly coordinated blushes in one single palette, Rimmel’s Match Perfection 3-Tone Blush creates a natural flush of color on cheeks and contains blue sapphire pigments for an all-over healthy glow.